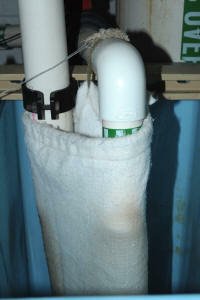 Using and cleaning good mechanical filters like the bag to the right, will greatly reduce the likelihood of ammonia anomalies. Ammonia Levels I've been having problems lately with my ammonia levels. I do regular water changes -- once every 3 weeks (I have 100 gallon). I feed my fish every day -- could I be overfeeding? <A possibility, others being inadequate biological filtration or incomplete cycling.> If so, should I go to feeding them every other day? <No, best to feed the proper amounts instead. Feed as much as can be consumed before the food hits the bottom of the tank or gets sucked up into the filters.> Should I still feed the algae to the tangs every day and just cut back on the frozen foods/flakes to every other day? Should I put vitamin drops in every day or just when they are fed? <I prefer to soak the food in vitamins rather than dose directly to the tank. -Steven Pro> Thanks so much. . . . . you are a great help!